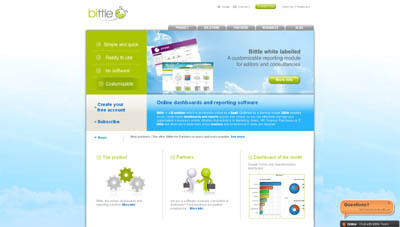 Bittle is a BI solution which is accessible online as a SaaS (Software as a Service) model. Bittle enables you to create digital dashboards and reports quickly and simply, so you can effectively manage your organization’s business activity. Whether that activity is in Marketing, Sales, HR, Finance, Purchases or IT, bittle will allow you to keep track of your metrics and no technical IT skills are required. OEM version : you can customize dashboard showing off your banner, logo, and colors within the dashboard you publish to your clients. Sharing and publication : once done with your dashboard, share it by printing it or publishing it toward your colleagues and/or customers in an easy way thanks to a permanent dynamic link. Partner Programs : Become Bittle Certified Partners wether if you are ISV’s, Resellers or a Consulting Firm.